Credit: Perez Ipiña et al. A team of researchers at Université Côte d'Azur and Centre Scientifique de Monaco has recently carried out a study aimed at better understanding the near-surface swimming patterns of bacteria. Their paper, published in Nature Physics, could shed some light on how bacteria explore surfaces, how they search for host cells and how they infect these cells. Bacteria often move near the surface of water or aqueous substances, which occurs for a number of reasons. First, nutrients in aqueous environments typically accumulate at their surface. In addition, host cells, which are particularly susceptible to becoming infected by pathogenic bacteria also sit on, or are part of, a surface (i.e. a cell tissue). Researchers have been investigating the near-surface swimming patterns of bacteria for several years. Past studies suggest that these patterns are determined by hydrodynamic interactions between bacteria and the surface they are navigating, which ultimately trap the bacteria in smooth circular trajectories that lead to inefficient surface exploration. 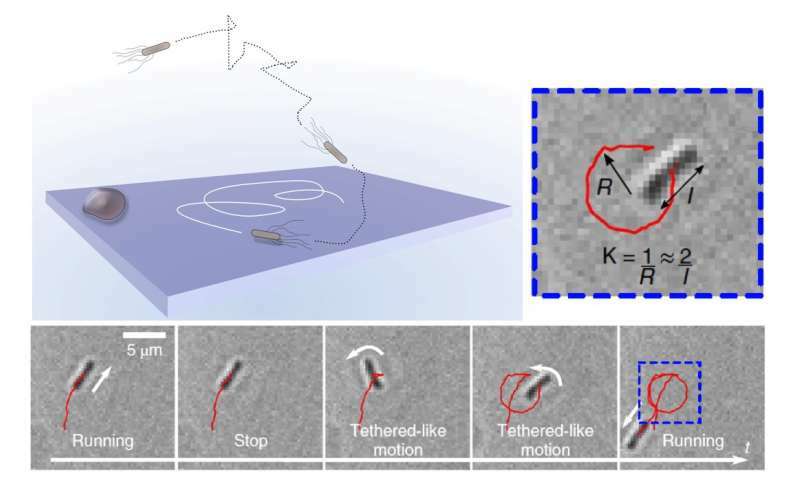 Physics research into the near-surface swimming patterns of bacteria suggests that an individual bacterium experiences an attraction toward the surface, as well as an effective torque caused by the rotation of the flagellar bundle, which forces it to move in circles. This well-documented observation can be explained by fundamental physics principles. When considering the picture painted by these observations, however, it is hard to understand how bacteria are able to survive, as their hydrodynamic near-surface interactions would appear to be a serious obstacle to their survival. What makes their endurance in such unfavourable circumstances even more puzzling is the fact that in evolutionary terms, bacteria should be able to easily explore surfaces in order to find nutrients and/or to localize colonization sites. "We were very intrigued by these issues and suspected that this reductionist fluid mechanics approach could not be the full story," Fernando Peruani, one of the researchers who carried out the study, told Phys.org. "We thought bacteria should be able to cope with this handicap: getting trapped in a circular orbit is certainly not an efficient way to explore a surface. With this idea in mind, we decided to study how different bacterial species move on surfaces with the goal of understanding how surface exploration is actually performed." The work of Peruani and his colleagues is part of a broader project aimed at better understanding how pathogenic bacteria infect host cells. In their recent study, they used video microscopy and tracked bacteria in a relatively large observation window, in order to obtain long bacterial trajectories. They later analyzed the statistics of these trajectories to closely observe the bacteria's near-surface swimming patterns. "The abrupt changes in the speed displayed by the bacteria, which indicated that bacteria were intermittently stopping, immediately intrigued us," Peruani said. "We then looked at the distribution of times bacteria were moving and not moving and understood that if a Markov chain formalism was used to describe the data, three states were required. This observation played a key role in our research." Subsequently, the researchers revisited the data they had collected and analyzed the periods in which the bacteria had 'stopped.' They observed that bacteria were often tethered to the surface and were spinning around one of the tips of the cell body. "The evidence was clear: bacteria were exploring the surface by performing transient adhesion events," Peruani said. "The next step was to construct a theory for a swimmer that has an internal state, controlled by a Markov chain, that adopts three possible values, each of them associated with a different equation of motion. This was a technical challenge, but the effort paid off." The theory developed by Peruani and his colleagues allowed them to conclude that the frequency at which the observed 'stops' were occurring was far from random. Rather than hindering the bacteria's activity, this frequency appeared to maximize their surface exploration. The study carried out by this team of researchers led to two very important observations. Firstly, the researchers realized that bacteria use transient adhesion as a mechanism to regulate surface exploration. Secondly, they observed the existence of an optimal stop frequency, which maximizes surface exploration. Enteroheamorrhagic E. coli (EHEC) and other pathogenic bacteria appear to be able to tune this frequency to its optimal value. "These two observations provide a better understanding of how bacteria explore surfaces, which is a necessary step to elucidate how they search for host cells, and how bacteria infect them," Peruani said. 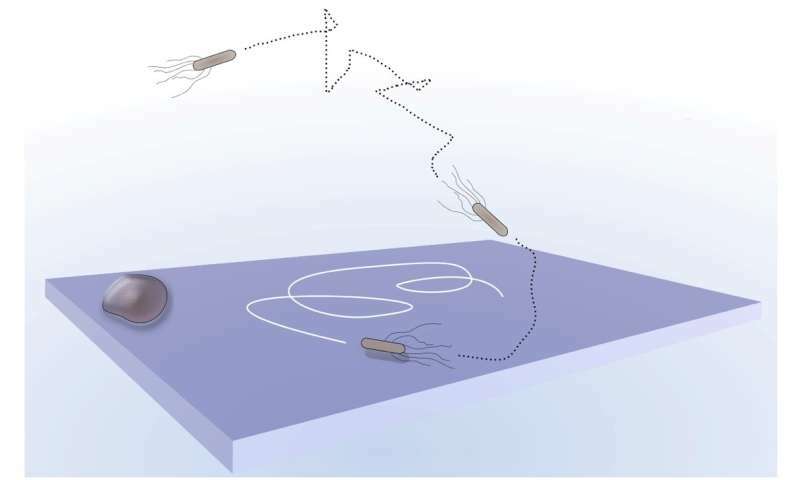 "An important message from this study is that a physical understanding on how bacteria move on surfaces cannot be based exclusively on hydrodynamic interactions. Adhesion interactions also plays a crucial role. 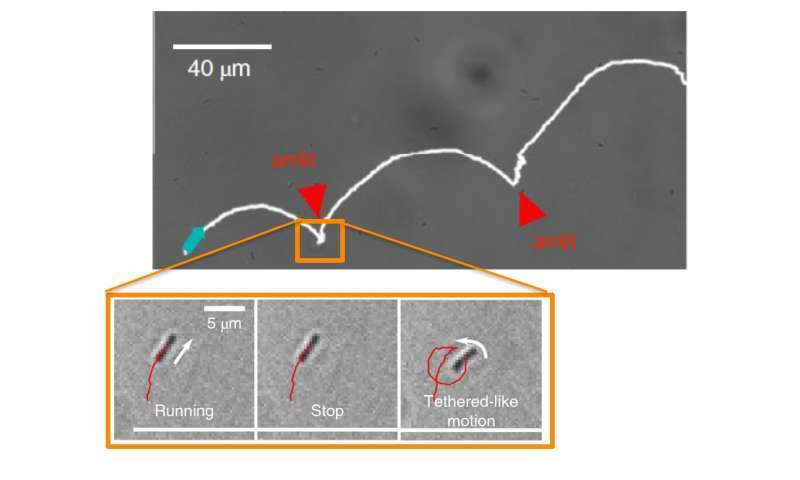 Moreover, it is the interplay between adhesion and the activity of the flagellar bundle that allows bacteria to reorient and escape from the circular traps imposed by hydrodynamic interactions." The observations gathered by Peruani and his colleagues offer valuable new insights into the well-documented near-surface swimming patterns of bacteria. The researchers are now planning further studies aimed at understanding how pathogenic bacteria search for and infect host cells. For different species of bacteria, they expect to observe different search and colonization strategies. However, they also suspect that the number of strategies they will observe will be significantly smaller than the number of existing species of pathogenic bacteria. "A quantitative, physical understanding of bacterial infections, which is still missing, may provide hints on how to prevent bacterial infections," Peruani added. "Our study, for instance, indicates that surface adhesion plays a crucial role in surface exploration. On the other hand, surface adhesion depends on the specific adhesins of the bacteria, as well as on the physical properties of the surface, and we will certainly try to think of ways to modify those physical properties." This is very exciting! Is there any protein can control the move of bacteria? Or this imaged protein can be identified through CRISPR/Cas9 gene editing system?